SAN DIEGO — Who says you have to have turkey at Thanksgiving, or beef or ham for holiday meals? Why not fish? Making a festive meal of seafood – especially purchased from your local fish market – is a clear option, particularly with so many people now rejecting meat for various reasons but continuing to eat fish. 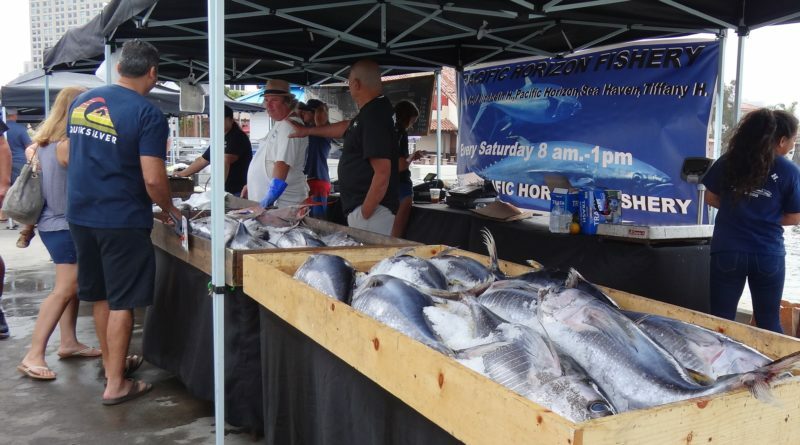 During the summer I checked out San Diego’s three-year-old Saturday morning outdoor fish market, the Tuna Harbor Dockside Market, held 8 a.m. to 1 p.m. I was bowled over at the bounty available. There may be only five or six stalls arranged along the pier between Seaport Village and Ruocco Park along the Embarcadero, but those handful of stalls staffed by San Diego-based fishermen and their families sell up to 10 tons – yes, tons – of fish they’ve caught every Saturday to hundreds of customers, including commercial buyers. While varieties vary by season and the individual fishermen’s catch, you can usually count on the availability of bigeye or yellowfin tuna, opah, skipjack, monchong, rockfish, sand dabs and wahoo. The best way to find out what’s for sale at the market is to sign up for the mailing list at thdocksidemarket.com. Every Friday you’ll receive a listing of what fish are available and their prices, both whole and portions. Lately whole ahi tuna has been running $3.50 per pound for the whole fish and $16.00 for a loin. Why should you care about a San Diego fish market if you don’t live or keep a boat in the vicinity? San Diego fishermen struggled for years to set up a pier-side market where they could bring in their boats and sell their catch. For many, having a direct-to-consumer supplemental sales income means they can continue their chosen way of life as commercial fishermen. It’s a hard, physically demanding, challenging life, especially since U.S. fisheries are the most highly regulated in the world. While many chafe at regulations and compliance difficulties, most fishermen recognize the need for regulations to preserve and manage fish stocks for future survival. But state law made it difficult verging on near impossible for fishermen to set up dockside markets until government officials found a way to issue the market a temporary one-year permit. When the market’s immediate success demonstrated the pent-up demand, then-House Speaker, now State Senator, Toni Atkins of San Diego stepped in and carried legislation, signed by Governor Brown in 2015, streamlining the permitting process and in effect legalizing open-air fish markets in California. If you’re connected to your fishing fleet and want your own dockside fish market, talk to local fishermen and encourage them to follow the lead of San Diego’s pioneers. The benefits for the community are clear. Increasingly, with all the scandals about food and especially fish production, people want to know where and how their food is produced. Kelly Fukushima, owner of F/V Three Boys and San Diego market regular, is a passionate advocate for the market and eco-friendly fishing techniques, enabling his crew to harvest from healthy fish stocks while protecting sensitive species. “There’s a real desire of people to be connected with their food source. They want to know that seafood is responsibly caught and that we’re not taking more than we need,” he explained. There are other benefits, too. You can get tips from both the fishermen and their families about what fish to buy and how to prepare it. The skilled staff at the cutting booth will also clean and fillet your fish for a nominal fee. And, like me, you might also summon the courage to go ahead and buy that whole tuna. One day – maybe for the holidays.